It’s a very Man Monday peeps. Friends. This last weekend I had the most EPIC culinary experience! Well, I mean, I haven’t had many epic culinary experiences… at most, I’ve had “awesome” or “just pretty cool” experiences. But this was beyond my biggest expectations! So what happened? Sarah and I went to Wooster, Ohio and spent three days being pampered by the awesome folks at Certified Angus Beef. I’m not going to go into crazy details about it just yet… I’ve been informed by my supervisors (Sarah and Addi) that that story is beyond my pay grade… so just be patient, and Sarah will tell you all about it later. Okay, now for the same ol’ Man Monday stuff. Now, this post has two purposes. First, I’m going to give you an awesome recipe, of course. Second, I am going to explain to you guys how November is going to go down. I’m committing to presenting 4 epicly awesome Man Monday posts in November! Scroll down to the bottom of this post for details. Today’s recipe is good enough that we’ve made it twice already. 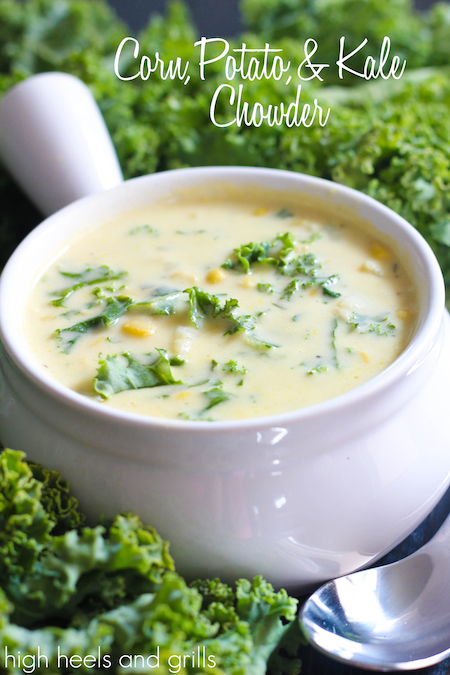 This corn chowder makes awesome leftovers too. You can whip up a giant batch, and eat it for the entire week. The best part? That’s exactly what I did, and by the end of the week, I still wanted more. Melt the butter with the olive oil in a large pot over medium heat. Add the onion, thyme, and garlic and cook for about 5-10 minutes, just don’t let it burn or get crispy. Slowly whisk in the flour until you get an even consistency. Stir in the veggie stock and bring to a boil. Once boiling, add the cream and potatoes. Bring back to a boil again, and boil hard for a good 10 minutes or so, stirring frequently. Add the frozen corn. This will decrease the temperature quite a bit, so make sure your potatoes are done before adding the corn. Decrease the heat and simmer for another 5 minutes. Add your parsley and kale and simmer until the kale is cooked just right. When is the kale cooked just right? Well, whenever the heck you say so, I don’t know how you like your kale, sheesh. Serve with anything you don’t love. Why? Because you will be complimenting the soup so much, that whatever side dish you add to the meal will feel jealous and have hurt feelings the whole night. It just won’t compare. First, a quick explanation. Holidays can be stressful. At least for me, a big reason for that is the planning for and the execution of the meals. So with ZPMHM, my goal is to take 90% of the planning out of the equation for you guys. How will I do that? I’m going to provide 4 recipes in November, an appetizer, an entree, a dessert, and a leftover. I PROMISE YOU, if you follow my recipes for your Holiday dinner, you will have a memorable meal, worthy of your holiday celebration, and good enough to impress. Not only that, but you’ll have leftovers too! I’m even throwing around the idea of including a few videos, to assist you in making this meal even more manageable. Soup season is my favorite. This looks delish and I can’t wait to try it! Good to know, thank you! Getting ready to make this now for supper! Follow up since I must not have clicked “post comment” earlier… THIS IS AMAZING!!!!!!!!!!! OMGosh, the wonderful flavor from the stock and the cream and the thyme. I’m already kicking myself for not making a double-batch so I can eat it as leftovers the rest of the week! We fried some bacon and chopped and sprinkled on top, as well! Thanks so much for a wonderful recipe! I was on Pinterest looking for meatless meals to serve for Fridays during Lent and came across your corn chowder recipe. The addition of the kale makes it look so scrumptious and I can’t wait to try it! I love making homemade soups, stews and chowders during the colder months of the year, as our New England winters can be pretty harsh! I tend to reach for the rib-sticking comfort foods that warm you from the inside~out. A giant pot of chowder is just what a cold crisp day like today calls for. Thank you for sharing this wonderful recipe, can’t wait to serve it!